The skies were threatening, but the promise of another great beer dinner event at Monk's Cafe in Philadelphia was way too great to keep us at home. We were fortunate enough to take an earlier train into Philly which allowed us first to stop off at Tria (review-3/06) for a pre-Monk's beer and cheese plate. The skies were clearing up by this point and the windows at Tria were open to create a nice after-work atmosphere. Around the table, we enjoyed an Allagash White, Victory Kölsch, and Jolly Pumpkin Wit with a plate of soft Brie-like cow's cheese from France. Fast forward a few blocks over to Monk's where we socialized with others before we were sat at our center booth table for dinner. We eased our way into dinner with a Gaffel Kölsch, Monk's "house" Gueuze, and a Stoudt's Fat Dog Stout (how's that for variety?!) Tom, Fergie, and some of the usual suspects were on hand as the dinner got started near 7pm. The dinner began with a quick intro from the usual emcee, George Hummel. He quickly turned things over to the good folks from St. Bernardus who filled the crowd with some stories and clarifications about the history of the brewery. Marco Passarella described the sequence of events in the 1940s as St. Sixtus beers were brewed with the assistance of Westvleteren to the 1960s and an agreement to brew with Deconinck to 1992 when St. Bernardus came to be the name we know it as today. He also cleared up any confusion regarding the smiling face that graces many of the St. Bernardus bottles. It is not that of a monk, but rather, as he put it, a counselor. No monks are involved in the brewing of St. Bernardus beers (nor were any animals harmed ;-) So, on with the dinner we went. A look over the menu had me believe that I would be look equally forward to the food as much as the beer. The kitchen, as usual, did not disappoint. For simplicity, I've listed the 5 course pairings of beer and food below. In short summary, my favorite food item of the evening was the opening Red Mullet and Scallop. Though, the Lobster Creme Brulee was a very nice dish of lobster chunks. My favorite brew was the St. Bernardus 12. (I went into the dinner with this expectation, so hopefully I didn't predispose myself to this judgment!) Though, a very close second (and a bit of a surprise) was the Wit. This was a very nicely made, not overstated, Witbier with subtle notes of honey, ripe banana, and coriander. And, my favorite pairing of the night was not actually a prearranged pairing. But, with the way pourings go at Monk's dinners, it is quite possible to make your own pairings as the night goes on, if you catch my drift! It was the Tripel with the Cornish Hen. The saltiness of the meat, the richness of the fat, and the sweetness of the peach/raisin compote made for an even better pairing with the Tripel than with the St. Bernardus 8. Finally, a simple creme-filled chocolate eclair with the 60th Anniversary was a real pleasurable way to conclude the dinner. It also was fun to have the 12 and the Anniversary 12 both in front of us at the same time to compare. For as much as I enjoy the Anniversary, at least on this particular evening it was better as a food pairing with the creamy filling of the eclair than by itself. Something about the scrubbing bubbles of the Anniversary made it pair better with the dessert. Though, all by itself, the smooth and lush 12 took the blue ribbon prize of the night! 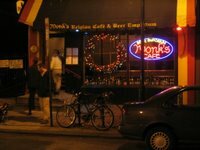 Thanks to Tom, Fergie, Adam, and staff for another fine Tuesday evening at Monk's. p.s. Adam took a couple of pictures and will put them up for you with his own review of the event. I will link it here. Sounds awesome. They're having a similar even tomorrow night at the Publick House in Boston. I want to go, but I'll be working in lab late to finish up a presentation for Friday. Have you had a chance to try the 60th Anniversary? It is quite good.